These are the two modes of thinking. They are mutually exclusive. Focused mode is put to use when we work in a concentrated manner on any problem/issue. Diffuse mode is related to the subconscious state of the mind. Related to resting, relaxed & sleep states. For e.g. listening to music, enjoying nature, walking , jogging etc. Have you ever wondered why it seems so easy for some to learn Japanese , while others have an apparent “problem”? Is it true that the ones who learn Japanese easily are plain gifted? Are there systematic ways for anyone to achieve mastery in Japanese? These are some questions we have been dealing with over the years. Experience in teaching Japanese to a range of students has revealed many things to us. These are time tested tips that we would like to share. In this article we will reinforce these tips with many useful findings from contemporary neurosciences. Make no mistake , there is a mind blowing amount of neuroscience research that goes into the space of learning & the brain. Equipped with an array of state of the art imaging & scanning tools, neuroscientists & learning specialists are doing their best to dive deep into this subject. We think that the research going on in this field is just the tip of the ice berg. Nevertheless even at this level it is amazing to know the basics of effective learning from a scientific perspective. This “gyan” combined with time tested learning techniques from Sakuraa form a perfect recipe for success in learning Japanese. So before we get to the Tips to learn Japanese effectively, let us understand some brain fundas. It weighs just 3 pounds , but consumes 10 times more energy than the rest of the body. This data in itself indicates the profound importance of the brain in a physiological sense. So think twice before calling any one pea brained! Review the details pertaining to the thinking modes & the memory types in the side bars. Equipped with this information lets us now move on to some of the effective learning techniques. Long term memory can be compared to an abundant warehouse which stores tonnes of information. However it ain't easy to retrieve information from here. We will further discuss on how to leverage this memory. Working Memory is like a quick scribble pad. It is immediate & from the conscious state, can’t hold much stuff (which is the actual challenge!). This is located in the pre-frontal cortex area. This is a very powerful technique. Avoid cramming Kanjis, grammar patters, vocabulary etc at one go, say before the exams. Remember them every day for a few days then give it a break of a couple of days. Then try remembering them again. Repeat this process. This helps store the information in an efficient & retrievable manner in the long term memory. 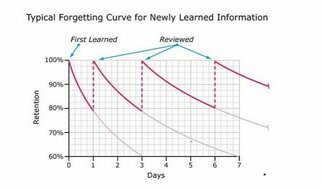 The neural network patterns created at the first learning event get reinforced when spaced repetition is practiced. The simple fact is that, building what is called “neural scaffolding” needs regular working. This is akin to muscle building done through regular exercise. Kick procrastination. This is a common enemy for many.The challenge of having to cover a lot of Kanjis , vocabulary etc could put off a person into a procrastination mode. The best way to avoid this is to focus on the process & not the outcome. That way one would not be challenging the brain into a specific outcome orientation. This technique has been proven to be useful. There are also methods like the Pomodoro technique. Only 25 mins of intense concentrated work & then a break. Then repeat. Reward yourselves for a specific achievement in the process. That way the brain will work towards the reward & not push one to avoid the learning challenge. At Sakuraa our Japanese teaching style involves intensive use of visual props to help understand various aspects of Japanese learning. For e.g. Picture & Mnemonics for remembering Kanjis. Video lessons for conversations. Such tools create & reinforce the visual memory, which is powerful. This leverages the brain’s ability to associate a picture or an event to an idea. It is our experience that students learn Japanese much better when they learn “through” Japanese . What do we mean by this? Using Japanese in office transactions, anime, watching Japanese movies etc help learning Japanese much better than just learning Japanese as a language. Thus learning Japanese language becomes a via media or a vehicle to achieve another interesting aspect & not an end in itself. Sleep is an area that continues to intrigue scientists. There is an incredible amount of research that is going on in terms of understanding sleep & its effects on the human mind. However few aspects are now clear to neuroscientists. The awake & active working states generates toxins in the brain. When a person sleeps, the brain cells shrink thus paving way for the toxins to be flushed out of the inter cellar spaces by fluids. This is why good sleep is refreshing. Sleep helps us develop answers to problems or challenges that we ponder upon. Point is not to loose sleep over anything, but to ponder over it just before sleep with an affirmation to learn that aspect. For e.g. learning vocabulary or imagining Kanjis just before sleep is a sure way to reinforce learning. The brain then takes over & strengthens the relevant neural; patterns involved. Infact short 20 to 30 minute naps (not in the class!) have been proven to be very powerful in the learning process. The graph below is very revealing. Words recalled improve with the nap duration. When dealing with abstraction or challenging subject areas it is important to know when to give up & let the brain do the rest. The conscious mind can be disengaged by the process of relaxation like listening to music, yoga, walking, jogging etc. This helps the brain get to the Diffuse mode of thinking, which can be very beneficial.